Elmo and the gang took their show overseas as part of Sesame Workshop's work with the International Rescue Committee to bring hope and education to children in war-torn countries. If you've ever wondered how to get to sesame street, you should -- currently sesame street productions all over the world is reaching out to a new group of children. Refugees. Here's ABC's chief foreign correspondent Terry Moran. I'm coming in. Bring it in. Oh, Elmo. Reporter: What a thrill this was. I'm so happy to meet you, Elmo. Nice to meet you. Hi. ??? If you're happy and you know it stamp your feet ??? Reporter: Elmo's a megastar like few others. He's been a fixture on "Sesame street" for over 30 years. Delighting generations of children and adults alike. What happened? Reporter: How are your friends on sesame street? Everybody on sesame street is having a really good time. ??? La, la, la, la, Elmo's world ??? Reporter: There's so much goodness for kids in the good times Elmo and his friends have on "Sesame street." And now they and the team on the sesame workshop are all embarking on an amazing new adventure. They're working with the international rescue committee to bring hope. Hope in the form of education. To the millions of children whose lives have been torn apart by the nightmare of the war in Syria. It's the largest humanitarian crisis of our time. More than 5 million people have fled Syria since 2011. Many seeking shelter in refugee camps in neighboring Lebanon, Turkey, and Jordan. These are children with the idea to make something of their lives, and we're determined to give them the chance. Reporter: Earlier this year Elmo and his furry brother grover traveled to you a refugee camp in Jordan to meet with some of the kids who now call that place home. Elmo realized when he was there that all kids are pretty much the same. You know, we have differences that Elmo has red fur. And they don't have red fur. But we like to have fun together. Did you think the children that you met over there were sad? Well, you know, Elmo thought that maybe some of the kids over there were sad. But Elmo tried to do his best to cheer them up and make them smile. Reporter: Sesame workshop and the irc are building local learning centers in the camps, making home visits too. Education is a haven for people who have lost everything and for children it gives them just an ounce of normality that can give them the chance to rebuild their lives. Reporter: And they're producing a new version of "Sesame street" in arabic aimed at reaching children in Syria, Iraq, Lebanon, and Jordan, especially the refugee kids. We will also do what "Sesame street" does best, and that's modeling inclusion and acceptance. Reporter: And you may not know this. There are already "Sesame streets" all over the world. From galigali simsim in India. To plaza sesamo in Mexico. ??? and jimajia in China. ??? you can find the same kind of educatesal muppet planet on six continents reaching countless children. And sesame workshop often develops new muppets, local characters created to address the needs of that culture. Take this little charmer. Oh, hello, friends. Reporter: From "Sesame's" South Africa show, "Takalani sesame." One in four children was affected by AIDS. We ended up Cathy the first ever HIV positive muppet. Her name was cammie. The other children at school don't want to play with me because I'm HIV positive. We were able to teach children you couldn't catch AIDS from playing with cammie. But most of all we were able to give children a lexicon with which they could talk about lexicon. Salam aleikhem. Another great example is in Afghanistan, where only a third of girls are educated. When we created our first local muppet, we thought long and hard but we knew she was going to be a girl. ??? You know I'm a girl who's going to change the world ??? ??? she's going to make this world a better world ??? Little boys who watch test 30% higher on gender equity, thinking it's okay for their sister to go to school. And that's the power of media and muppets. Are you thinking of a character for this sesame street who would be a refugee? Yes. But so much thought and research will go into what this character ultimately becomes. Reporter: Earlier this summer I went to Lebanon to meet with some of the children that would benefit from this project like 6-year-old aziza and her brother, 5-year-old Ibrahim. Ibrahim. Reporter: They fled here with their family from aleppo, Syria in 2014. What's the best thing about being here? I walk with Ibrahim and aziza through the dusty cam op to their school. This is the arts center here. This one you did? Reporter: It's a haven. [ Speaking foreign language ]. Reporter: You can feel it instantly. Ibrahim's teacher tells me he's changed since he started coming to class here. He loves school now? Yes. Reporter: He's like he loves this place. Then in this little school in Lebanon so far from their homes the children get a surprise visit. It's ton-ton. She's a muppet from the local version of "Sesame street," produced in nearby Jordan. [ Speaking foreign language ]. Reporter: Look at those faces. And you understand the magic, the power of sesame. That magic begins back in the states at sesame workshop. This is zirok. Reporter: Sirok who debuted just this year is zari's brother from the Afghanistan production of "Sesame street." So you tested out what his skin should feel like and the color of it. We brainstormed on whether it should be even fur or fleece. It was a big debate. Reporter: Every single detail is thought out, every as peblth Desi aspect designed to tach with the local culture in mind. We wanted to make sure he looked Afghan so Afghan children could see themselves when they see zirok on screen. We looked at different fabrics Reporter: The next project, a muppet for the refugees. All part of what's really a rescue effort. The great American story is that the privileges of the few can be taken to the many. Reporter: And Elmo knows the difference that can make. What do you hope for those kids when they grow up? Well, Elmo hopes the same thing thael Moe hopes for everybody, which is to stay positive and bring them love. Reporter: For "Nightline" I'm Terry Moran in New York. 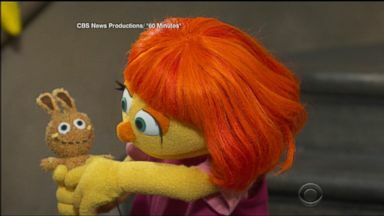 Next month, viewers of ""Sesame Street" will be introduced to Julia, a Muppet with autism.